I’m not going to mince words when these issues came out, I was really torn. I didn’t like them that much, but I really loved the new heroes it introduced. Well, not Huntsman so much, but Savant, Mr. Majestic, and Soldier! But that was back in the day when I didn’t have that much comic reading under my belt, and scarcely knew the name Chris Claremont. Now that I’ve grown up, and read all those classic X-Men back issues and I’m more on board with this run than I was as a kid. Hell, thanks to “Jay & Miles X-Plain the X-Men” I can’t help but hear some of Wu’s narration in their “Angry Claremontian Narrator” voice. I’m a more nuanced comic reader now that I’ve learned some more history… some 20 odd years later, and I actually kind of enjoy it. 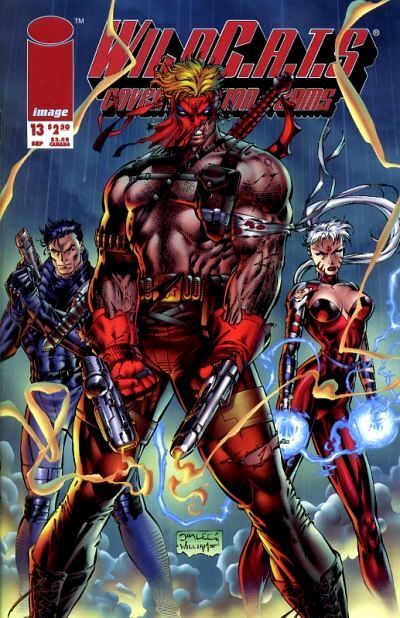 Mind you, not as much as I did later issues of “WildC.A.T.s” but I didn’t dislike this as much as I did in my youth. The first issue in the arc kicks off with Zealot trying to combat train Priss down by the waterfront near New York. Now, I have no idea if this kind of area even exists in New York City, but it does in the WSU, so we’re going have to accept it. Priss isn’t high on becoming a Coda warrior and Zealot seems chill not to take it that far (well, chill as a clef blade to the neck) when suddenly a ship explodes into the sky featuring a wounded man named Alabaster Wu. Mr. Wu’s being pursued by a beast known as a Raksha. Zealot makes short work of the Raksha, decapitating it in front of Priss, as she goes to investigate the ship while Wu takes the hell off. Turns out, Wu knows Jacob, and he needs his help! But getting to Marlowe is easier than it sounds, as he’s being chased by Priss. Oh yeah, that cut up Raksha, it totally infected Priss, taking over her mind and body, giving her a mad on to hunt down Wu. Zealot is working her way through the ship, and she comes upon a small and passed out girl. She vows to protect this child from the beasts and starts kicking some Raksha booty. Eventually, the girl’s protector, the Huntsman, shows up and they declare a truce after a bit of back and forth between them. During the battle, Zealot took some damage from a Raksha, and a Raksha has blood that’ll eff you up, it’s a “turn you into a literal Raksha” eff you up kind of problem, so Huntsman wants to help get Zealot someplace where they can get her some help. I mean, a good idea would be to go meet back up with the rest of the WildC.A.T.s, right? Well, the rest of the team is busy. See, Wu got a hold of Jacob and Jacob goes to meet Wu alone. While this is happening, Raksha possessed Priss convinces the team that Wu is trouble and that they need to go save Jacob from him. So Void teleports the team to where Wu and Jacob are and they’re suddenly under attack from the Troika (Attica, H.A.R.M., and Slag) who are joined by Void Jr. AKA Providence. It’s all a set up by the true villains of the story, Tapestry and Lord Soma. They hired the Troika, who I guess brought Providence along for the hell of it, and are quite pleased to see a Raksha take over one of their enemies already, Priss. Who is Tapestry? She’s some kind of witch that can undo your life’s events and rewrite them. Not sure if she’s overwriting these events in reality, or just in one’s brain. Either way, in the end, it’ll bend your personality to whatever Tapestry wants. Lord Soma? Oh, he hangs out with Tapestry. That’s about it. We’re not even sure if he’s a Kherubim or Daemonite high lord, like everyone else who has the title “Lord” in WildStorm books. Maybe Lord is just his first name, and his parents didn’t spell it “Lorde” because he’s a precious little snowflake with his gray skin, facial tattoos and on point mustache and soul patch game. While all that is going down we cut away from the action to meet a young woman with a short haircut, who’s at an art gallery, getting hit on. She introduces herself as Cordelia Matheson, but we’ll quickly come to know her as Savant (AKA Kenesha AKA Zealot’s little sister AKA I ain’t spoiling the dumbest reveal in WSU history if you don’t know it already.) Zealot sent a message to her, because when there’s big trouble, like turning into a beastly alien trouble, you call family. Savant get’s a hold of our old friend Soldier, as it is up to her to round up the cavalry, mainly because I don’t think she knows about the rest of the WildC.A.T.s, not that it would do her much good right now anyway. Hell, the only other person she knows to call on is Mr. Majestic. Who’s Mr. Majestic you ask? Mr. Majestic lives above the arctic circle and is basically Superman. I mean, so is Union, but Mr. Majestic more so. Also, he’s Kherubim, so he fits in the WildC.A.T.s side of the WildStorm Universe a bit better. He was also on Team One, so he knows Zealot and Marlowe at least. Savant, using her skills and artifacts, finds him, and talks him out of his self-imposed exile to help Zealot. And boom, he changes from a flannel and jeans to a full on superhero outfit, complete with cape, and he’s off to save the day. Ok, back to the main action, Tapestry has royally messed with all of the WildC.A.T.s she can get her hands on, in one way or another, and they’re all beholden to her. To stave off become a Raksha, Zealot unleashes the powers that she learned from Tapestry in their shared history (more on that later.) So now Zealot has frizzed out hair and wields the same ability to rewrite souls/back stories (or what have you) that also Tapestry wields. Savant and Mr. Majestic show up and they are not having it! Hell, even Zealot knows it and is pissed that Savant took too long to get there to help her, and she had to manifest this unknown power. Hell, Zealot used it to take down Slag! While Savant, Mr. Majestic, Zealot and Huntsman are sitting around arguing, Zealot realizes that H.A.R.M. had been taken out, too! Turns out, that was thanks to our old buddy Cole, back from Chicago! Yay, Cole! So, game plan time. Mr. Majestic, Savant, Cole, Soldier and Huntsman take on the Tapestry altered WildC.A.T.s, Zealot goes after Tapestry and Lord Soma, while everyone forgets about Priss. Don’t worry, Priss gets totally saved by the power of friendship from the two HALO employees that don’t have superpowers, go Stansfield and Jules! The fight mostly works and all the pieces fall into place, and in the end it is Huntsman who saves that day. He does it with a piece of the orb that gave Void and Providence their powers. Tapestry and Soma make their escape and the heroes are all kind of left standing around trying to figure out what to do with crazy god-mode Zealot. Ok, now time for the secret origin of Tapestry and her ties to Zealot in a story coda named “the Price.” Alright, Tapestry was once an old crone, who apparently always had her powers, not much is know beyond that. Savant had become poisoned somehow, so Zealot sought Tapestry out to fix her. Tapestry tells Zealot that the price of helping her sister will be 100 years of servitude, and because she can, she’ll remake Zealot into a subservient personality type for the next 100 years as well. Zealot submits, and it’s the end of the whole story. It even says “Fin” at the end, which is infuriating when you know how often Claremont likes to end stories with the text “the beginning” and how that would’ve been 100% relevant this time! I know I’m reading too much into things, but we have a ship, bursting into the air out of nowhere, and a bad guy yelling about chasing Alabaster Wu across one or a thousand worlds, and I’m starting to think “Is this the first time we have a reference to “the Bleed” and a type of Carrier? Nah, you’re right I’m just reading into things too much again. Is it a shame that we don’t see Tapestry again until “Savant Garde” issue 3? Nah, she was only an OK villain in the end, wasn’t she? I always assumed that Majestic went into his self-imposed hiding because of “killing” John Cole back during the Team One days, but how is that represented by a dolly? Is there something that we’re not knowing? Something that seemed like a good idea at the time, but after Alan Moore took a crack at Majestic it no longer made a lot of sense? I can’t remember, is the dolly or an incident regarding a child ever made clear or referenced again?